Apollo Justice starred in his own Ace Attorney game, which was the fourth Ace Attorney game in the series, after Phoenix Wright was disbarred. Even though Phoenix Wright is back for the forthcoming 3DS title Ace Attorney 5, Apollo Justice is once again returning to the series. Though, he looks worse for wear. A lot worse. 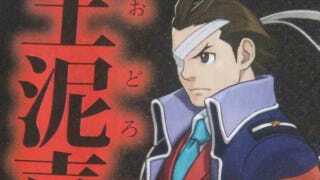 In case you missed it, here are Kotaku's impressions of the upcoming Ace Attorney 5.